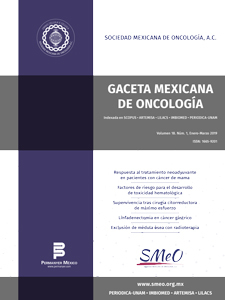 The Gaceta Mexicana de Oncología (GAMO) is a high quality scientific blind peer-reviewed journal of open access that communicates to health professionals the most relevant and up-to-date advances in research and education, in order to offer cutting-edge multidisciplinary care to cancer patients. It is the official scientific and academic dissemination body of the Mexican Society of Oncology (SMeO). It publishes its regular issues bimonthly in electronic format, with free access, in addition to several supplements during the year. Its spaces are open to members of the SMeO, as well as to any member of the medical community (national and international), who show interest in using this publication to publicize their studies under the rules of the editorial policies of the journal. It is the journal of choice for oncologists in the field of research and education in surgical, medical, paediatric, gynaecological, haematological and radiological oncology, as well as specialties for the detection, diagnosis, treatment, follow-up and rehabilitation, fields in which different specialties involved in the management of cancer patients participate.